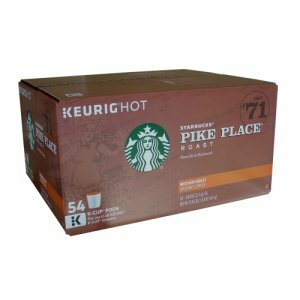 ZinZor.Com now has Starbucks Pike Place Roast Medium, 54 K Cups Keurig in Stock. Starbucks K Cups, Pike Place Roast Medium Roast Coffee. Pike Place Roast is an amazing blend with soft acidity, smooth body and subtle flavors of cocoa and toasted nuts. Rich in Flavor yet balanced enough to enjoy every day. 54 count k cups.